A slowly rotating neutron star with a weak surface magnetic field is giving off bursts of X-rays and gamma-rays. This discovery may have implications for how some of the most powerful magnets in the cosmos evolve. Several NASA telescopes including Chandra, Swift, RXTE, XMM-Newton and Fermi contributed to these results. Observations with NASA's Chandra, Swift, and Rossi X-ray observatories, Fermi Gamma-ray Space Telescope, and ESA's XMM-Newton have revealed that a slowly rotating neutron star with an ordinary surface magnetic field is giving off bursts of X-rays and gamma rays. This discovery may indicate the presence of an internal magnetic field much more intense than the surface magnetic field, with implications for how the most powerful magnets in the cosmos evolve. The neutron star, SGR 0418+5729, was discovered on June 5, 2009 when the Fermi Gamma-ray Space Telescope detected bursts of gamma-rays from this object. Follow-up observations four days later with the Rossi X-Ray Timing Explorer (RXTE) showed that, in addition to sporadic X-ray bursts, the neutron star exhibits persistent X-ray emission with regular pulsations that indicate that the star has a rotational period of 9.1 seconds. RXTE was able to monitor this activity for about 100 days. This behavior is similar to a class of neutron stars called magnetars, which have strong to extreme magnetic fields 20 to 1000 times above the average of the galactic radio pulsars. As neutron stars rotate, the radiation of low frequency electromagnetic waves or winds of high-energy particles carry energy away from the star, causing the rotation rate of the star to gradually decrease. Careful monitoring of SGR 0418 was possible because Chandra and XMM-Newton were able to measure its pulsation period even though it faded by a factor of 10 after the initial detection. What sets SGR 0418 apart from other magnetars is that careful monitoring over a span of 490 days has revealed no detectable decrease in its rotation rate. The lack of rotational slowing implies that the radiation of low frequency waves must be weak, and hence the surface magnetic field must be much weaker than normal. But this raises another question: where does the energy come from to power bursts and the persistent X-ray emission from the source? 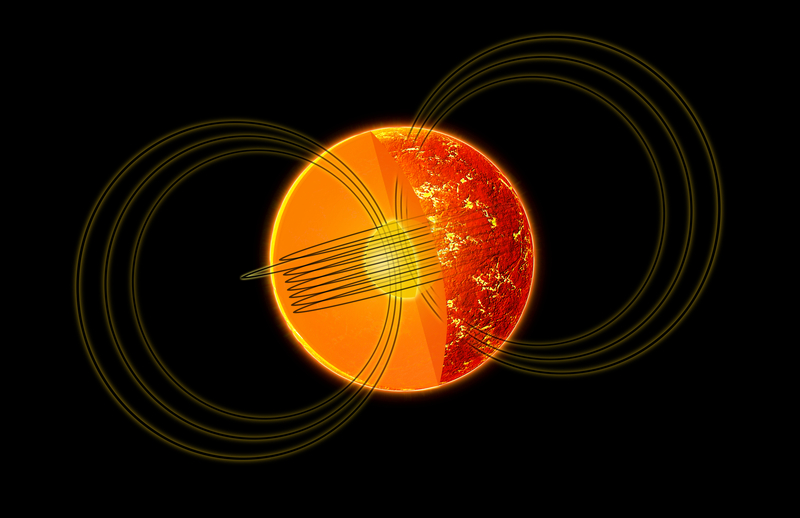 The generally accepted answer for magnetars is that the energy to power the X- and gamma-ray emission comes from an internal magnetic field that has been twisted and amplified in the turbulent interior of the neutron star, as depicted in the illustration above. Theoretical studies indicate that if the internal field becomes about ten or more times stronger than the surface field, the decay or untwisting of the field can lead to the production of steady and bursting X-ray emission through the heating of the neutron star crust or the acceleration of particles. A crucial question is how large an imbalance can be maintained between the surface and interior fields. SGR 0418 represents an important test case. The observations already imply an imbalance of between 50 and 100. If further observations by Chandra push the surface magnetic field limit lower, then theorists may have to dig deeper for an explanation of this enigmatic object. This discovery is the result of an international teamwork from CSIC-IEEC, INAF, University of Padua, MSSL-UCL, CEA-Saclay, Sabanci University and NASA's Marshall Space Flight Center (MSFC). These results appear in the October 14th issue of Science Express, which provides electronic publication of selected Science papers in advance of print. NASA's MSFC in Huntsville, Ala., manages the Chandra program for NASA's Science Mission Directorate in Washington. The Smithsonian Astrophysical Observatory controls Chandra's science and flight operations from Cambridge, Mass. Gamma-Ray Bursts (GRBs), Soft Gamma-Ray Repeaters (SGRs), and Anomalous X-Ray Pulsars (AXPs), appear to be related phenomena. If so, then, like GRBs, SGRs (and AXPs) are powered, by accretion, of infalling material, onto the central massive compact object. Is there a limit to the mass of a magnetar? what are the limits to a hypernovae? What is the output of power from a hypernova? Magnetar stars are incredible strange what size they are. Why those bursts are so big? Very enigmatic indeed. Glad to see that we still haven't cleared up all the mysteries yet. The cosmos still fills us with wonder, and that is what drives us and refines us as a species. I love your website. Keep up all the excellent work you do. Thanks. Excellent post. Very informative and interesting. If my figures are correct that is about 6.6 revolutions per minute. How is the mass figured out by knowing how many revolutions the star performs. This is very fascinating stuff.